5:30 pm ET - Checkered flag on the last session of the 3 day test. Patrick and Darren will come in on the next lap and we'll head back to the paddock. Thanks for checking in with us. We'll be back on track for the Sebring race, March 21, 2009. 5:12 pm - No. 46 pits again for a shock change, rollbar change and other adjustments. 5:00 pm - Seth pitted in the No. 46 and Darren Law is now in the car. In the No. 45, Patrick is back in the pits in the No.45 - the last setup change went "in the wrong direction" so he is back in for a fix. 4:42 pm - Patrick is in the pits in the No. 45 for a setup change. The 45 finished their tire tests during the last session, so they are now working on their shock and other adjustments. Patrick has now had three days to get used to being back in an RSR (after a year in prototypes with Penske in 2008). The No. 45 crew will try and use as much of this last session as they can to progress on setup. Jan 28, 2009 - 4:10 pm ET - We are on track for the final session of the three day test. Seth Neiman is in the No. 46 and Patrick Long in the No. 45. Red flag - we are not sure yet what the issue is. 2:34 pm - The No. 45 has finished its tire test. Joerg pits for driver change to Patrick Long. Patrick will run out the session - just six minutes left - about 2 timed laps. 2:24 pm - Seth pits for more water in his water bottle and fuel. joerg is still out in the No. 45. 2:13 pm - Things are all good here but it's pretty quiet. Joerg Bergmeister has taken over for Patrick in the No.45. 9:32 am ET - Seth spun in the No. 46 and is back in pit lane for new tires. Patrick is still out in the No. 45. January 28, 2009 - 9:20 am ET - Good morning from Sebring. It's the third and final day of our test and our first run with the 2009 Porsche 911 GT3 RSRs. Our test session this morning runs from 9:10 to 10:50 am. The second sesion is 1:00 to 2:40 and the last session is 4:00 to 5:00 pm ET. So far so good this week, we have been progressing through our setup and development plans as scheduled. We have three cars here this week, two 09 Porsches and one of our 08 cars. The 09 Porsches are numbered the No. 45 and the No. 46 - these will run as the No. 45 and No. 44 during the season this year. The No. 44 that we are running here is the 08 Porsche. Patrick Long is out now in the No. 45 and Seth Neiman is in the No. 46. Darren Law is in the pits waiting for his turn in the car. I asked him about the new cars, "I drove the new car on Monday and did a few laps in it on Tuesday. In general, the cars have been really good so far. I think it says a lot that within the first two days of running the new cars, we've almost equalled our lap times from last year; it shows a lot of promise for the season, especially when you consider the additional restrictions that have been placed on the GT2 cars this year." 3:52 pm - The No. 46 is in the pits for a driver change from Joerg to Johannes. Seth is also getting into the No. 44. 3:45 pm - Darren just completed three laps in the No. 44 and is now bringing it in for Seth to hop in. Just over 30 mins left in the session. We have one more day on track on Wednesday, then will pack up and head home to Sonoma, California. 3:30 pm - Things are pretty uneventful here, which is great. The No. 45 is well into its tire test - No. 44 and No. 46 are continuing to make setup changes. We see Doug Fehan (Corvette Racing's Program Manager) next to our pits timing the GT2 cars... And some of the Risi contingent just appeared in our pits, checking in. They are not testing here this week. 2:30 pm - Green flag. Patrick is out on the No. 45, Joerg in the No. 46 and Seth in the No. 44. Engineer Stefan Pfeiffer is still making incremental setup adjustments. Both cars have a tire test planned later in the session once the engineers are happy with the setup. In a tire test, the team compares the new 2009 tires with last year's tires - alternating between them in short and long runs. Jan 21, 2:25 pm ET - We are 20 minutes into this afternoon's session. Patrick and Joerg have switched cars for this session - Patrick in the No. 45 and Joerg in the No. 46. Seth is in the No. 44. Red flag and all three cars are in the pits. This is the second and final test of the day and runs to 4:20 pm. 9:50 - Both the No. 45 and 46 are back in the pits for shock adjustments, ride height and other changes. The No. 44 is back on track with Seth behind the wheel again after a shock change. Craig told Patrick in the No. 46 to go ahead and run out the sessios (just 8 minutes left) and that this would be the last change they would do. the No. 44 is back in the pits for one more change from crew chief Tommy Sadler. 9:41 - Green flag. Patrick is out again in the No. 46 and Joerg in the No. 45. 9:36 am - Patrick is in pit lane in the No. 46 and was ready to head out again after a change when a red flag was called. We don't know what it's for yet. Seth Neiman in the No. 44 is also in the pits. Joerg was the last of the three back to the pits. We will sit tight until we get the go ahead from race control. 9:15 am - 45 minutes left to go in the session. Patrick Long is still in the No. 46 and Joerg in the No. 45. 9:00 am - Patrick Long just radioed in to warn the No. 44, which is running just in front of him that he's "on a hot one". The fastest time so far this morning is a 2:01.9 by Joerg in the No.45 on the 3.7 mile course. Patrick was just behind him with a 2:02.00 Although it's difficult to compare times from a January test here to a March race, the fastest practice lap time in 2008 (qualifying was not held) was 2:00.945 (Jaime Melo, Risi Competizione). So we are a second off of that. Chief strategist Thomas Blam said, "We are seeing some good times this morning. We are running under ideal track conditions - the sun is out and the track is fast. We will probably see times drop off this afternoon. The GT2 cars have been slowed down from 2009 (due to regulation changes - see the Car Prep Notebook tab on the www.lizardms.com home page for details) so it's difficult to really tell yet how things will play out in March." 8:45 am - Chief engineer Craig Watkins is sitting next to me in the pits. I asked him how things were going - "So far, overall, testing is going well. On the 09 cars, today our focus is on getting the damper comparisons done and test the 09 tires and make a few minor kinematic adjustments. We are still not at a point yet were we can tell the significance of the improvements of the cars from 2008 - we should have a better idea by the end of the test tomorrow." Tue Jan 27 - 8:30 am - No. 45 and No. 46 are back in the pits. With the tires and the track starting to warm up, the drivers can now give more detailed feedback. The aero changes in the new 09 Porsche gave the car a lot more downforce. The Sebring circuit is very bumpy and rough, so the drivers and engineers are focused on figuring out how to set the car up to manage the bumps without sacrificing speed. Johannes is now also in the pits in the No. 44 with a driver change to Seth Neiman. We are running three cars at the test this week - the two new 2009 Porsches (the No. 45 and No. 46) and one of our 2008 cars (the No. 44 at this test). For the ALMS season, we will run just two Porsches this year - the No. 44 (running as the No. 46 at this teas) and the No. 45. Timing and scoring is not available to us in the pits so I won't have times until after the session. Tue, Jan 27 - 8:23 am - All three Porsches pitted for the engineers to make setup adjustments. Joerg will stay in the No. 45 and just headed out again. Johannes is still in the No. 44 and Patrick Long is now in the No. 46, taking over from Darren. All three cars left the pits and are back on track. Because there are a limited on number of cars at this 3-day test, there is very little traffic, which makes it much easier for the drivers to focus on getting the cars dialed in vs. managing traffic. A few more cars just left pit lane - including the No. 87 Farnbacher Loles Racing Porsche. They also have a new 2009 car this year. Because the new Porsches just arrived in the U.S. last week from Germany they are all white and won't have their full liveries until the SEbring race. Tue Jan 27, 8:00 am - We are on track for this today's first session - all three Porsches are on track - Joerg is in the No. 45, Darren Law in the No. 46 and Johannes van Overbeek in the No. 44. After just one lap, Joerg radioed in that the Porsche is "fast today." This is a 2-hour testing session and runs until 10 am ET. The new Rahal BMW is also on track right now. The track is still very cold - the fog has just lifted and it will take a while before things warm up. The No. 15 Lowes' Acura prorotype and the No. 66 Acura just left pit lane for their first runs of the day. Patrick Long drove the new 2009 Porsche for the first time in this second session today. His take on the car so far "I did two timed laps just to get a sample. Joerg (Bergmeister), Stefan (Pfeiffer, No. 45 engineer) and Porsche have been working today through the rollout and I think we are just starting to get a balance on the handling. For me personally, it's great to be back in an RSR. It's the perfect blend of technology with the practical feel of driving. I'm looking forward to being back with the Lizards - this time for a full season." Joerg is out of the car - his reaction "It's always hard to say at Sebring: the track is sometimes really fast and sometimes not so fast, timewise we are not as fast yet as last year, but the balance of the car feels really good. So now we have to focus on the details and dialing it in to get the car to where we need it to be." Seth just got out of the car - his take so far, "Every year, we come to Sebring with a new car and our first challenge is to come to grips with how it is different. Clearly has made some advances with the front grip and it is also clear that we don't know how to make them go fast yet." 2:06 pm ET - Patrick Long heads out in the No. 45.Joerg is sitting on pit wall debriefing with Roland Kussmaul from Porsche and No. 45 engineer Stefan Pfeiffer. 2:00 pm ET - Things are going very well so far - Seth Neiman is just getting out of the No. 46 so I'll be able to get his perspective in a minute. Darren Law, looking very tired after his win yesterday at Daytona, will get into the No. 46. Joerg is still out in the No. 45 and will switch shortly with Patrick Long. 12:35 pm ET - The first of the two afternoon sesssions is underway. Both new Porsches are now on track - Joerg Bergmeister is in the No. 45 and Seth Neiman in the No. 46 (the No. 46 will run the season as the No. 44). Mon January 26 - 10:00 am ET - Good morning from Sebring. It's a beautiful day here - mild and no wind - looks like it will be quite warm later in the day. We have two cars out for this morning's session - one of our new 2009 Porsche 911 GT3 RSRs and one of our 2008 cars. This is the first time that have we've run the new 09 cars and we've spent the last week getting them ready for the test. We have only one of the new cars on track right now - the other is in the garage and will be out later in the day. Joerg Bergmeister is out first in the No. 45. So far, things have gone smoothly as they did several install laps and now are beginning to shake down the car. Seth Neimas is on track in the 2008 Porsche - we are running that car as the No. 44 for the test. (The second 2009 Porsche is running as the No. 46 here.) For the season, the Porsches will run as the No. 44 and the No. 45. The drivers are all very happy this morning - three of our five drivers were on the podium at the Daytona 24 yesterday. Darren Law won in the DP class with his teammates from Brumos and Joerg Bergmeister and Patrick Long won in GT with TRG. Congratulations to everyone! This is the ongoing blog for Flying Lizard Motorsports. 2009 is the sixth consecutive ALMS season for the Sonoma, California-based GT2 team. Since its first year of competition in 2004, the team has finished every year in the top three in the ALMS GT2 team and drivers' championships. Notably, in 2008, the team won both the ALMS GT2 drivers' (No. 45 Porsche of Joerg Bergmeister and Wolf Henzler) and team championships. In 2007, Flying Lizard was second in the ALMS GT2 team championship and No. 45 drivers Johannes van Overbeek and Joerg Bergmeister finished second in the ALMS GT2 drivers' championship. The 2009 ALMS season spans 10 races throughout North America. The season kicks off in March with the Mobil 1 Twelve Hours of Sebring and concludes with the season finale at Laguna Seca on October. Flying Lizard has also competed in the 24 Heures du Mans from 2005 through 2008, finishing third in 2005, fourth in 2006, and sixth in 2008. Flying Lizard Motorsports was founded in 2003 by team principal (and driver of the No. 44 Porsche) Seth Neiman. The team is based in Sonoma, California at Infineon Raceway. Team partners include Porsche and Michelin. 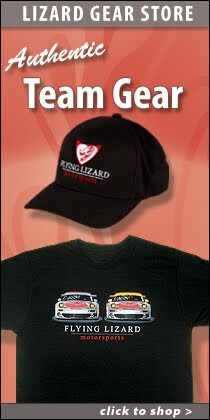 Visit the Flying Lizard website and online store at www.lizardms.com. Copyright © 2009 Flying Lizard Motorsports, LLC. The Flying Lizard text and Flying Lizard logotype are trademarks of Flying Lizard Motorsports, LLC. All Rights Reserved.